Preface: this is a “sequel” to my previous article on the new dodge and burn plugin in Aperture, so it’s best to read that one first! Clicking the little “brush” looking icon brings up this dialogue. You’ll see the adjustment you want (exposure, which is essentially dodge and burn together depending on if you set a positive or negative value for the tool) and the standard size/feather/flow for the brush. Note that as far as I can tell there is no kind of pressure sensitivity control when using a pen tablet as with aperture. You have 2 brush “presets” A and B and can switch between them. I usually keep one as a soft brush and one as a hard brush. Another interesting feature is the “auto mask” which essentially tries to keep the adjustment you are painting within the boundaries of the area you are working in (by finding the edges and containing it within them). This seems to work fairly well on some images (that have clearly defined areas/regions, like burning the sky against a building for example) and not so well on others. Still a neat addition. Now here we come to a fundamental difference between the Lightroom and Aperture implementations. While Aperture essentially has a “layer” for each adjustment (dodge, burn, saturation etc…) which you paint into, Lightroom uses discreet “point based regions” for each adjustment. To clarify: in Lightroom every time you make a “new” adjustment it creates a “point” which is a little white dot around which that brush stroke adjustment is based. This is essentially the anchor for the adjustment region, and you simply paint on the adjustment you want. Now the annoying thing (to me at least) is the fact that there is no way of toggling the “overlay” of the brushed/adjusted area the way there is in aperture. When you hover over on the the “pins” it comes up with the area highlighted, but only while you are hovering over it. Sometimes you really want to be able to fine tune the edges of your adjustment area, and it is difficult to do this without having an overlay view. Hopefully this is something that will be implemented by the final release. I also wish they would make the overlay a color rather than just a translucent grey/white as sometimes it is difficult to see when brushing an effect onto a bright/white area. As opposed to the Aperture paradigm of having a single adjustment layer with various intensities, here you are more likely to make multiple overlapping “point” regions, and adjust them individually after the fact. Unfortunately what I found was that this lead to a lot of “guesswork” for example when you want to lighten an area, first you have to guess how much exposure should be applied, then brush it in, then further refine it by adjusting the level, then if a “sub-area” need to be lightened/darkened more you have to create a new overlapping point region and again guess how much exposure is needed and adjust from there. I give the win to Aperture’s implementation for ease of use and intuitiveness, but I can see the potential in having independently adjustable brush-edit regions. that is the inclusion of the edits in the adjustment history for the image. As mentioned before, Aperture creates a separate .tiff file from your master .raw when you invoke the burn and dodge tools. While not a huge drawback (it’s no different than roundtripping it to Photoshop for example) it adds a layer of complexity, as you are now essentially adjusting 2 images. Lightroom on the other hand, makes the adjustments exactly the same as any of it’s other adjustments – meaning they they apply to the raw file, and are included in the history. Being able to step back and forth through the edit states of an image is just a fantastically useful feature, and a huge point in Lightroom’s favor. In conclusion after using both tools for a short time now, I am really torn. I like apertures implementation overall better – it feels more natural and almost “painterly. I can definitely appreciate the approach of Lightroom’s implementation, but to me it isn’t quite “there” yet – there are a few annoying little details that make it less useful overall – the overlay is rather useless, with no toggling option and there really should be some kind of pressure sensitivity. It would also be nice to be able to label the “pins” to easily remember which pin went to which adjustment. I also really miss brush based blur and sharpening (both of which Aperture has). Aperture 2.1 dodge and burn module – a quick tutorial and review. “brush” based Dodge and Burn based tools. After a weekend of playing with aperture’s new burn and dodge plugin, I remain as impressed with it as I was at first. Quite frankly with this module and 1 or two more plugins, I may well never open photoshop again! (hyperbole, I’m sure). So without further ado, a quick summary of how the tools work, and my experiences working with them. First off – there has been some complaints that aperture creates a .tiff copy of your image when opening in dodge&burn (D&B) rather than working on the actual raw image. The way I see it is that you would be doing that *anyway* if you were round-tripping to photoshop, so you are not losing anything – and you are gaining the ability to edit “in house”. Note the heavy shadow on the grapes. Yeah, I should have used another light for fill – sue me. Now on to the plugin. Unlike the standard image adjustments, the dodge and burn tool (the name is slightly misleading as it actually does more than just dodge and burn – it also allows saturation, sharpening and contrast brushes. Cool!) is invoked by selecting an image and going to image -> edit with->dodge and burn. This opens the image in a popup window with the dodge and burn controls. If you’ve used photoshop, these controls will be immediately familiar – there is brush size, hardness and strength right up top. By default, scrolling the mouse wheel increases/decreases the brush size, and pen pressure controls the effect strength. Fantastic if you work with a tablet (and you should be!) The control scheme is very natural and took no getting used to whatsoever. You can hit “Z” to zoom to full size just as in the normal viewer, and holding spacebar “grabs” the image allowing you to scroll around it quickly in fullsize view, just like photoshop. With regards to the actual tools, they are divided into separate sections, selected from the dropdown menu on the left. As a photoshop user, you might think of each tool as a separate layer with it’s own quickmask. Click any tool to select it and start “painting on that layer” I have selected dodge, to lighten up the shadows on the underside of the grapes, to make them “pop” I select a large, soft brush and start with a relatively low effect strentgh (repeated passes will build up the strength of the effect so it’s good to start low to begin with). I quickly paint over the grapes, and there is a noticable lightening of the shadows (amaizingly without bringing up much noise!) Now what’s really cool is that as you work, you can instantly swith between the normal image view where you can see the effect of the tool, and what apple calls “overlay” mode which actually shows you where you have paintined on the effect and the strength (kind of like quickmask in photoshop). Clicking “O” toggles between the two modes. I found this to be absolutely critical and gave a very fast and accurate tool to fine tune the area and strength of effect, allowing very precise control. Note that you can still brush on the effect in overlay mode. You can also switch back and forth between tools, each get’s it’s own “layer” to paint on, with it’s own overlay mode. As you select each tool, you can turn the effect on and off to see the results by pressing “S” I found myself quickly going back and forth between tools, dodge/burn/saturation to tweak the images in various points. And if you ever find that you’ve painted too much or in the wrong area, simply select the eraser tool, and erase the effect back. The eraser works much the same way as the brushes, meaning it can have varying hardness and strength so that you can simply lighten an effect that was painted on too strong, or completely erase a mis-stroke. Another tool worth mentioning is the “feather” brush. This allows you to quickly blend the edge of an effect to make it more subtle. I found this to work *very* well, and really allowed for some sophisticated effect blending to look totally natural. To illustrate the feathering, I have brushed on an effect with a brush at 0% softness and 100% effect strength, to give a completely hard-edged, stand out effect. Now, I go over the edges with the feather brush, and they soften and smooth out, giving a much more natural transition. Now that was just a dramatic example – when you feather a more normally applied effect, it works even better. The results are subtle, but it really adds an edge to the image. I found it quick and easy to switch between different effects, painting them on and erasing them, and quickly toggling overlay to view the progress. Though not used in this image the sharpen and blur brushes can be used in much the same way in portrait/glamour retouching (although photoshop may still be required for some of the more sophisticated retouches of that sort!) And that’s about it! it’s rather simple, but I found it to be one of those “does exactly what it is supposed to do without a lot of extraneous junk” kind of things, which I really like. Basic dodge and burn +brush based adjustment functionality, basic yet powerful controls. The image after a quick D&B: Now if you are a photoshop user, none of these features may seem like a big deal – “So what” you might say, I can already do all that in Photoshop”. And you are right – none of the tools themselves are revolutionary, but the fact that you can now do it *not* in photoshop is quite intriguing. Dodge and Burn functionality was something that I was honest surprised was *not* included with aperture or lightroom to begin with, as it is pretty fundamental to a lot of photograhic processing (at least for me coming from a wet printing background!) It’s addition really takes the processing capabilites of aperture to the next level. The fact that it is based on an open plugin architecture further leaves the door open for other modules and even more powerful processing capabilities. It will certainly be exciting to see what comes down the pipeline in the next year or so! Posted on 1 Apr ’08 7 Apr ’08 Categories photographyTags aperture, aperture 2.1, brush based tools, dodge and burn, photo technique, photoshop, tips and tricks2 Comments on Aperture 2.1 dodge and burn module – a quick tutorial and review. I recently read about a great idea for a new slr innovation over at photographyblog.com. Zoltan Avra-Toth proposes an entirely new focus mode for modern SLRs. Frankly I am somewhat surprised no camera maker has thought of/implemented this before as it would be pretty easy to do from a technical point of view. Anyway, what he proposes is to have a focus mode that automatically focuses to the hyperfocal distance as the focal length of the lens changes. Focusing a lens to it’s hyperfocal length is a very useful technique, used mainly by landscape and street photographers, but the lack of a distance scale on most modern SLR lenses makes it rather impractical to use, particularly with zooms (as the H.D. changes with the focal length). However, making the necessary calculations would be a trivial task for the camera’s on-board processing, and since the camera and lens “communicate” focal length and focus settings it could easily adjust the focus to hyperfocal dynamically as the focal length changed. In fact, adding this mode probably wouldn’t even need any hardware changes, it could likely be done with a firmware update! Of course the hurdle would be practical implementation – in other words, how would you “set” this mode, and how would it “handle” the camera. E.g. when in normal af modes, the camera focuses when you 1/2 press the shutter button. In this new AF-H (autofocus-hyperfocal) mode, you definitely wouldn’t want that, as it would be refocussing every time you tried to take a shot. I think the easiest solution would simply be to add another position on the af selector switch for AF-H and have it decouple focus from the shutter button when you switched it on. This could also be done in a menu, without changing the hardware, but that could get confusing as people would forget they had it on and wonder why their camera wasn’t focusing when pressing the shutter button. Anyway, I think it’s a fantastic idea that would appeal to a large set of pro & advanced ameture photographers. So if anyone out there from a camera company is reading this – bring it to your R&D team, and get it done! POLL: how do you do b/w conversions. Now while I’m one of those crazy folk who would love a dedicated black and white sensor in a dSLR, (resolution, no bayer filter etc…) I’m realistic enough to realize it’s probably never going to happen, and really I’m ok with doing b/w conversions. It has the added bonus of being more flexible than a straight up b/w image with regards to what you can get as the final output. What’s your favorite method of b/w conversions in digital? Post it here and I’ll give it a whirl! Posted on 22 Jan ’08 Categories UncategorizedTags photo technique, tips and tricks4 Comments on POLL: how do you do b/w conversions. I never did much in the way of panoramas, but the G9’s little panoramic mode makes it so easy it’s hard not to. you simply put it in pano mode, and it provides guidelines to line up your shot as you pan from side to side. Click off the number of shots you want, matching them up as closely as possible using the LCD. I did a quick 3 shot pano of the view off our balcony in St. John. Opened them in photoshop, and stitched together, preserving perspective. The results were quite nice, I think I will definitely be using the pano mode more. Just another reason the G9 rocks my face. As I mentioned in my previous article, I see the canon G9 as a excellent camera for “street photography” (at the risk of offending the leica-philes!). However, it still poses the same problem as any other digicam for street photography and that is LAG. Chris Shepherd over at shepherdpics.com has written a great, multi-part article on matting and framing your prints. Check it out HERE, he pretty much covers everything you could want to know from equipment to materials to techniques. I love landscape photography. It is an amazing feeling to capture the majesty and splendor of the world around us in a photograph. Of course, thousands of other photographers have felt the same way over the years. And plenty of ’em are better photographers than me! It is very easy to take the exact same snapshot as everyone else. Especially when it comes to beautiful, scenic locations and landscapes – The very thing that makes them so appealing to you, has almost definitely made them appealing to hundreds/thousands of other photographers over the years. The task of creating a unique photo is daunting – how does one find a distinguishing vision in a scene that has already been done thousands upon thousands of times? 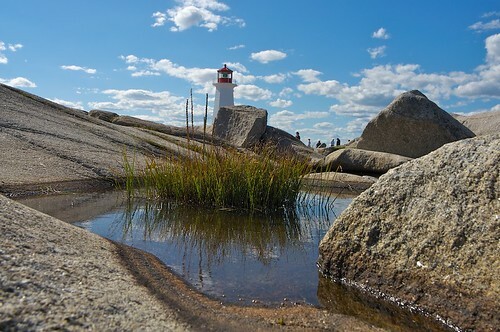 Take for example, the lighthouse at Peggy’s Cove in Nova Scotia. It is a wonderful photo destination, the glacial rocks create an almost otherworldly landscape and the cutest of quaint little fishing villages surrounds it. When I was at Peggy’s Cove I really wanted to get some nice photographs, however I also wanted to avoid the overused, “standard lighthouse shot”. This got me thinking about the technical elements of creating a good landscape photo and how to use them to create one’s own personal vision in a landscape, and hopefully avoid shooting the same shot over and over. The following are just a few tips to hopefully help “break out” of the standardized landscape rut (we’ve all had ’em!). 2. Think long. Landscapes don’t always = wide angle. Often a moderate tele or even a telephoto lens has the effect of “compressing” the scene visually. It also allows to focus on one dramatic element – not all landscapes have to be wide, sweeping vistas! 4. dont forget the foreground. Using a very wide angle lens is actually surprisingly difficult – with such a large field of view, it is easy for the composition to “lose focus”. 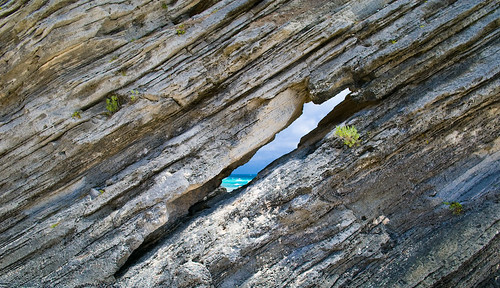 Use the perspective distortion to your advantage – include a dramatic foreground element to “anchor” the composition. Because of the wide angle perspective distortion, the foreground elements become large, and provide a point of focus in the overall composition. 5. remember the basics. Standard “rules” of photography also apply – remember the rule of thirds, and don’t put the horizon dead center. Of course all these rules are just guidelines – do not hesitate to break any of them if the composition calls for it, but remember – they are called “rules” for a reason. Most of the time they will add to the photo. Now go out and landscape! Artificial light comes in two predominant flavors: strobes (flashes) and continuous (sometimes called “hot lights”) the main problem with both of these (from a “photographing artwork”) perspective is that they tend to be very directional and rather harsh – leading to the dreaded, detail destroying GLARE! 3. give even coverage to the artwork. Now there are any number of ways to do this. Photographic lighting is all about modifying light by bouncing, reflecting, diffusing etc… there are reflectors, umbrellas (reflective & shoot through), softboxes, bouncecards for flash… There is a whole world of lighting modifiers for studio lighting, and it is easy to get overwhelmed, so we’re going to keep it simple! Now, If you already happen to have studio strobes, you probably *already* have various lighting modifiers that can soften the light – softboxes, umbrellas, etc… If you don’t, fear not! You don’t have to spend hundreds (thousands?) of dollars on professional lights to photograph your paintings. First thing is to set up the artwork. I like to hang it against a background of black velvet, as the velvet will cut down even more on extraneous reflections. I got a huge piece of black velvet fabric from a fabric store for <$20. once the artwork is hung and straight (use a level) set up the lights. You want to position the lights on either side of the piece, at around a 45 degree angle, both equidistant from the artwork. The trick is to position your lights pointing *away* from the artwork, and use the foamcore to reflect the light back to it, creating a much softer, diffuse light. I like to use a plain old straight-backed dining chair. Prop the foamcore against the back of the chair (where your back would go if you were sitting in it) and clip the light to the front, pointing at the foamcore. The light will reflect and give even coverage to the artwork. Move around the position and angle of the setup until you get proper coverage. in other words, put the light sources closer rather than farther to get more even coverage!